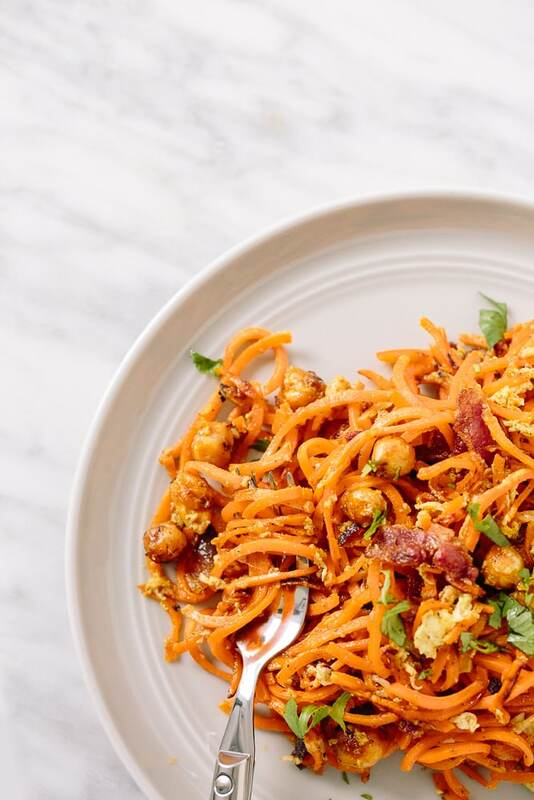 Since my Sweet Potato Carbonara was such a hit, I figured I’d give that recipe a little update, by using more-accessible bacon (instead of pancetta) and cramming in some extra protein, flavor and texture with chickpeas. One of my favorite dishes I’ve ever had at a restaurant was actually a chickpea, bacon and kale salad — when the chickpeas get cooked in that bacon grease, they absorb all those savory and salty flavors. As I write this, I’m listening to Miles Davis in my new office! If you missed it last week, I finally signed a lease on my very own office space, and I’ve been moving in since about Wednesday evening. Right now, I’ve got my desk, a brand new 27″ Mac desktop (probably the best thing since sliced bread), a photography desk area, some rugs, and about 50% of what I need for a fully functional kitchen. I actually thought about just bringing down my kitchenware on the days that I’d be cooking, but then I thought: the whole reason I wanted to get an office was to have my own dedicated, 100% Inspiralized space. Bringing down kitchenware would make it seem like a make-shift space or a temporary space or something. And for everyone that’s been asking, I simply rented a studio apartment in my building. It is so convenient and much cheaper than renting an office space – or even renting a co-working office. Plus, I have my own kitchen, my own bathroom, etc. Very happy, to say the least. 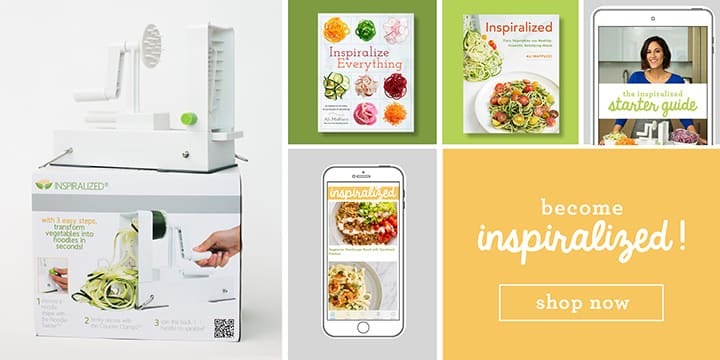 Today’s also the last day to enter to win the Inspiralized giveaway, a little celebration for the new look of Inspiralized and the new office space. You can enter below – US addresses only, this ends at 11:59pm EST tonight – and I will be announcing the winners on the blog tomorrow! Heat a large skillet over medium-high heat. Once pan is hot, add the bacon and cook until crispy, flipping halfway through. Remove half of the bacon grease and reserve in a small cup or bowl. Then, add in the shallots and red pepper flakes to the skillet. Cook the shallots for 1 minute or until softened. Add the garlic and cook for 30 seconds or until fragrant. Then, add in the sweet potato noodles, season with salt and pepper and toss. Cook, stirring often, until cooked through, about 7 minutes. Meanwhile, blot the chickpeas with a paper towel to remove excess moisture and then add to a medium mixing bowl with the onion powder, chili powder, paprika, and salt and pepper. Mix well. Once noodles are done cooking, set the noodles aside and wipe down the skillet carefully, scrubbing off any browned bits. Add in the reserved bacon grease add in the chickpeas. Cook for 5-7 minutes or until browned and crisping up. While the chickpeas are cooking, combine the eggs and parmesan cheese in a bowl and whisk together until not very clumpy. Season with the salt and pepper and set aside. 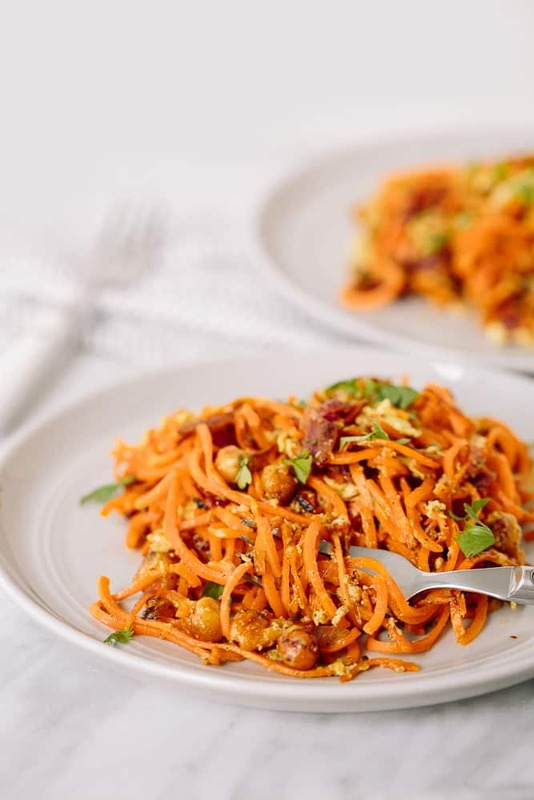 Once chickpeas are done cooking, add back in the sweet potato noodles and crumble in the bacon, then toss to combine. Remove from heat and slowly pour in the prepared parmesan sauce, stirring constantly, over the noodles. It's important to do this slowly and stir constantly so that the eggs cook while they heat up in the noodles. Use as much sauce as you want until the pasta has enough sauce for your preference. 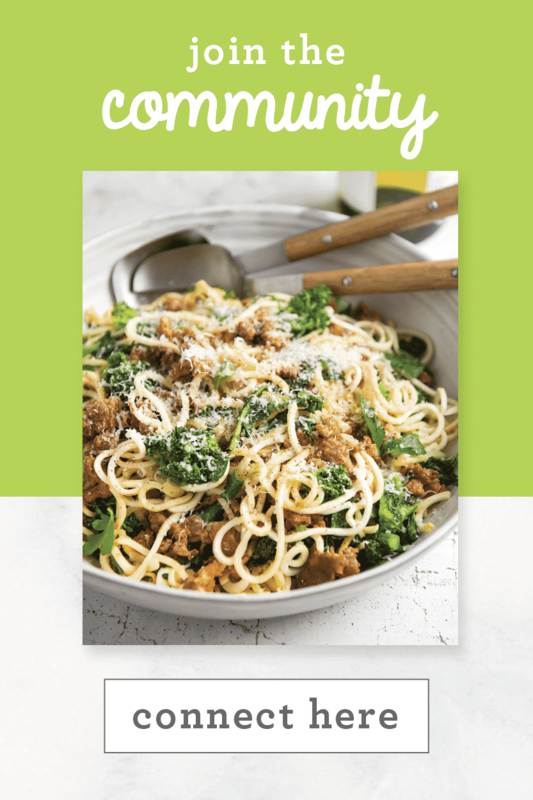 Divide the pasta into bowls, top with parsley, and serve. The recipe shown on my screen ended at Step 4.. Hoping there is a way to get to the rest of it; it sounds wonderful. Yep, the same happened with me. Yes...same happened to me... I hope Ally sees these comments and posts the entire recipe...sounds super! Yep, same thing happened to me. Ally, hope you're reading these comment 'cause the recipe looks fantastic! I was traveling all day, but I am back and now the recipe is fixed! Thank you for your patience. You go girl! Thanks, I can't wait for my next day off so I can try it!!! A studio apartment is SUCH a great idea for your office space!! Congrats! Jennie: If you're blind, most of us are too. The recipe stops at step 4. Hopefully, Ally will fix the problem soon 'cause I REALLY want to make it! Thank you for your support (from the beginning!) I really appreciate it. 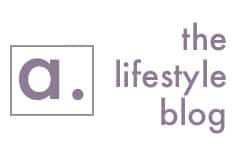 I love the new logo and website look! I also think renting a studio apartment in your own building was brilliant! 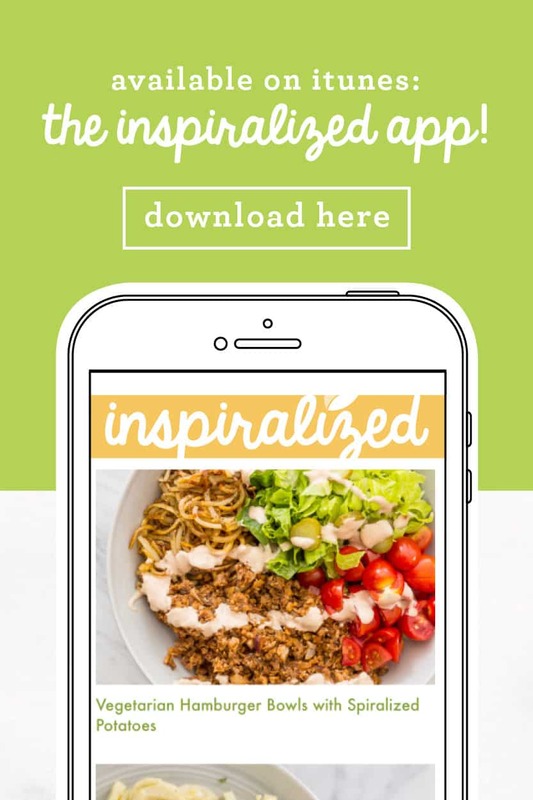 Yay for a dedicated spot for inspiralized! Congratulations Ali. I love the new website, and I agree, the remaining steps in the fantastic looking recipe are missing. Ali, cookware, office equipment and office furnishings plus rent, electric are all tax deductible as a business expense. Be sure to save all your receipts. Ditto on your travel for business. Genius idea to rent the studio for your office. And the good part, when you close and lock the office door at night, business is done for the day! 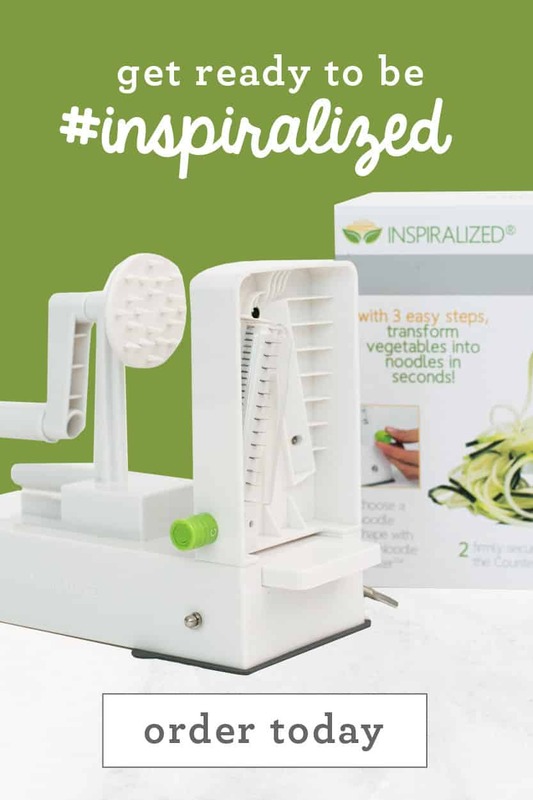 I am a somewhat new follower and do not yet own an inspirilizer, but have tried a few recipes with traditional noodles and loved them all. Makes me want one that much worse. Lol Congratulations on maKing the awesomely convenient, not to mention cost savvy idea of the studio apartment office happen. 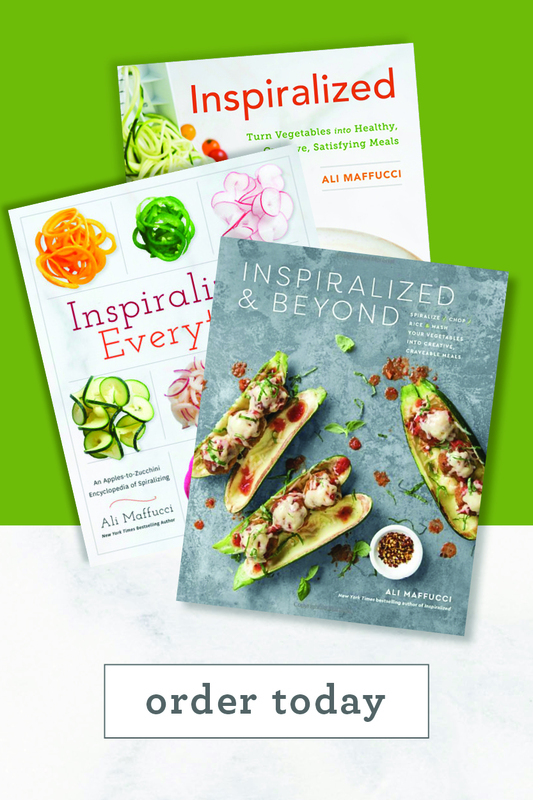 I am eager to see what new inspiration and recipes come from the fresh new space. Have fun and keep up the Great work! 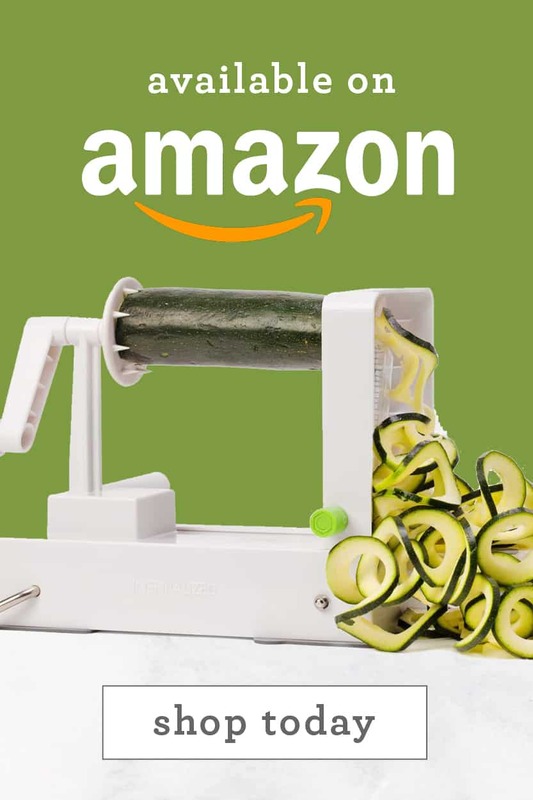 I mean seriously, how did we ever LIVE without spiralizers!? 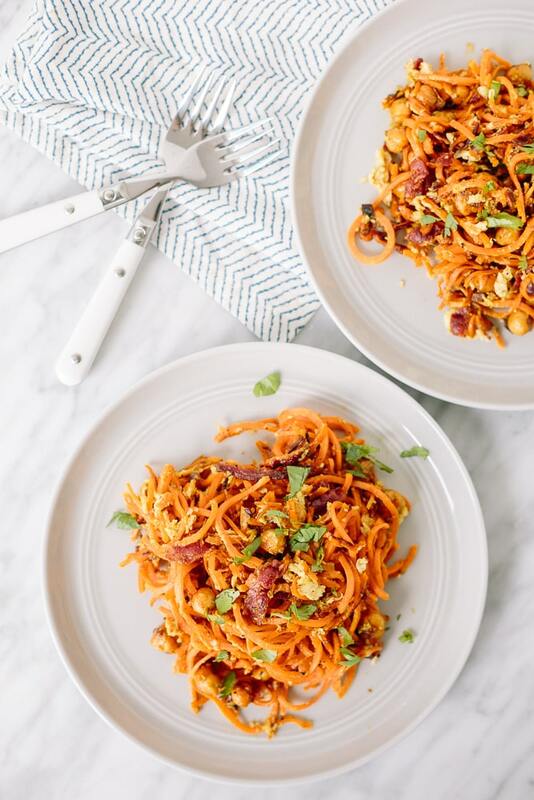 I am so in love with this recipe- I mean, bacon pasta, duh- and cannot wait to try it out! 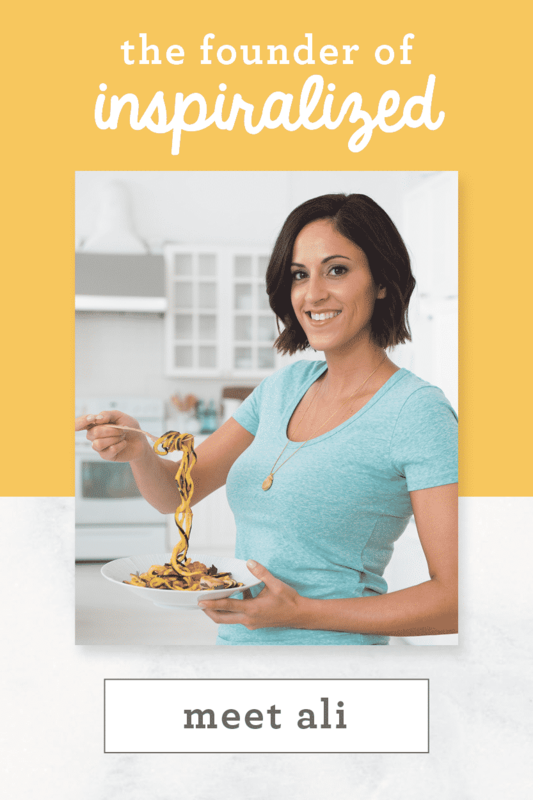 I can't wait to try this recipe!! I have a question about "ricing" sweet potatoes in my food processor: I did that last week and the bowl of the processor is now stained orange! I tried soaking it with hot soapy water, let vinegar stand in it all day, ran it through the dishwasher and it's still orange. Do you know of any tips to remove the discoloration? Thanks so much! I must be blind but what blade do we use? Is it C? Thanks! 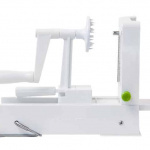 The recipe doesn't say which blade to use to spiralize the sweet potato. This is delicious! I made it yesterday for lunch (very quick and easy to throw together) and again today for lunch. I like the kick that the chili powder gives the flavor. I did find that my sweet potato noodled cooked faster when I covered the sweet potato noodles while they cooked. They took about 12 minutes uncovered and the recommended 7 when covered on my gas stove. I didn't alter the recipe at all, but I'm curious if this could be made dairy free. Thoughts?